Prevents cracking, chapping and drying. Free from petroleum, artificial colors and preservatives, Himalaya Herbals Intensive Moisturizing Cocoa Butter Lip Balm is a luxurious blend of exotic butters that soothes and prevents chapped and cracked lips. Cocoa Butter, a rich source of Vitamin E, soothes and hydrates the lips. Sal Butter, an antioxidant, softens and moisturizes lips. Our lip balm provides nourishing care and long-lasting moisture to keep your lips soft, supple and healthy. 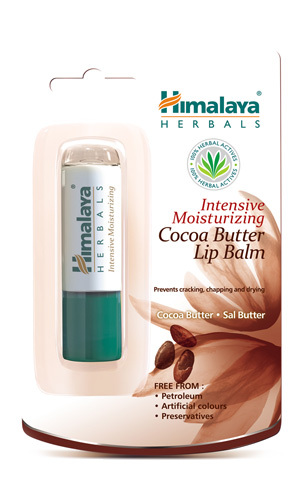 Apply Himalaya Herbals Intensive Moisturizing Cocoa Butter Lip Balm liberally on lips when needed.